Martha Grover is a Professor in the School of Chemical & Biomolecular Engineering at Georgia Tech. She earned her BS in Mechanical Engineering from the University of Illinois, Urbana-Champaign, and her MS and PhD in Mechanical Engineering from Caltech. She joined Georgia Tech as an Assistant Professor in 2002, and received an NSF CAREER award in 2004. In 2011 she received the Outstanding Young Researcher Award from the Computing and Systems Technology Division of AIChE. Her research program is dedicated to understanding, modeling, and engineering the self-assembly of atoms and small molecules to create larger scale structures and complex functionality. Her approach draws on process systems engineering, combining modeling and experiments in applications dominated by kinetics, including surface deposition, crystal growth, polymer reaction engineering, and colloidal assembly. She is a member of the NSF/NASA Center for Chemical Evolution, and Georgia Tech’s Decision and Control Laboratory. My research activities in process systems engineering focus on understanding macromolecular organization and the emergence of biological function. Our group's research activities in process systems engineering focus on understanding macromolecular organization and the emergence of biological function. Discrete atoms and molecules interact to form macromolecules and even larger mesoscale assemblies, ultimately yielding macroscopic structures and properties. A quantitative relationship between the nanoscale discrete interactions and the macroscale properties is required to design, optimize, and control such systems; yet in many applications, predictive models do not exist or are computationally intractable. The Grover group is dedicated to the development of tractable and practical approaches for the engineering of macroscale behavior via explicit consideration of molecular and atomic scale interactions. We focus on applications involving the kinetics of self-assembly, specific those in which methods from non-equilibrium statistical mechanics do not provide closed form solutions. General approaches employed include stochastic modeling, model reduction, machine learning, experimental design, robust parameter design, and estimation. 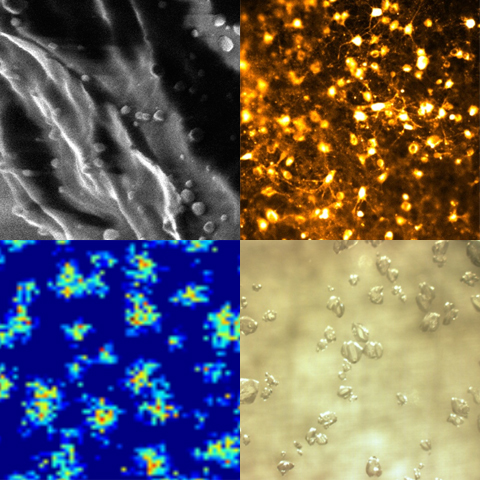 Clockwise from top left: SEM image of silver nanoparticles on paper (Casciato); microscope image of fluoscence of a dissociated neural culture (Kuykendal); microscope image of paracetamol in ethanol (Li); kinetic Monte Carlo simulation of self-organization in replicating polymers (Walker).